Note: When using the A/V Mute feature, the projector lamp is still on. To turn off the lamp, turn off the projector. Press the power button on the projector or the remote control. The projector displays a shutdown confirmation screen. Press the power button again. (To leave it on, press any other button.) The projector beeps twice, the lamp turns off, and the Status light turns off. 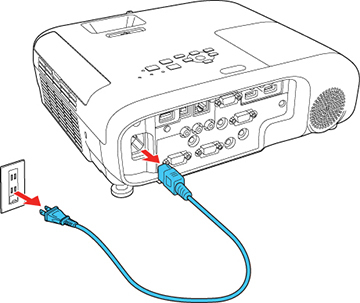 To transport or store the projector, make sure the Status light is off, then unplug the power cord. To avoid damaging the projector or lamp, never unplug the power cord when the Status light is on or flashing.